HIDALGO, TEXAS (September 25, 2015) — With plenty on the line for the pair of bantamweights headlining “Bellator 143: Warren vs. Davis” on Spike, it wasn’t surprising that both Joe Warren (13-4) and L.C. Davis (23-7) looked to showcase their strengths in front of a capacity crowd at State Farm Arena in Hidalgo, Texas. For Warren, his game plan was obvious, utilize his world renown ground game to nullify the striking of Davis and — much as he’s done throughout the numerous victories in his career — receive the nod from the judges scoring at cage side. After 15 minutes, the strategy worked perfectly, as “The Baddest Man on the Planet” managed to completely dominate Davis with his wrestling and earn a unanimous decision victory (30-27, 30-27, 30-27). After the fight, the Colorado native pulled no punches, making it clear that he feels his next fight should be for Bellator MMA Bantamweight gold. Kendall Grove (22-15, 1 NC) and Joey Beltran (16-12, 1 NC) set aside their longstanding friendship on Friday to compete in the co-main event of “Bellator 143: Warren vs. Davis,” a bout that saw “Da Spyda” take home the emphatic knockout victory. After the fight, the 38-fight mixed martial arts veteran made it clear that he wants a rematch with former Bellator MMA Middleweight Champion Brandon Halsey. With the win, Grove has now finished 16 of his 22 wins via finish and in the process spoiled Beltran’s undefeated record as a middleweight. Following a frenetic, back-and-forth contest that saw both featherweights have their shining moments, Emmanuel Sanchez (11-2) grinded out a split decision (30-27, 27-30, 29-28) victory against Henry Corrales (12-2) on Friday night in Hidalgo, Texas. There were multiple instances in the fight where Corrales seemed close to tapping, but following some nifty escapes, the former King of the Cage champion managed to escape and keep the contest close on the feet. If Sanchez keeps stringing together performances like the one he showcased on Friday, being mentioned in the same air as De La Hoya likely won’t be an issue going forward. 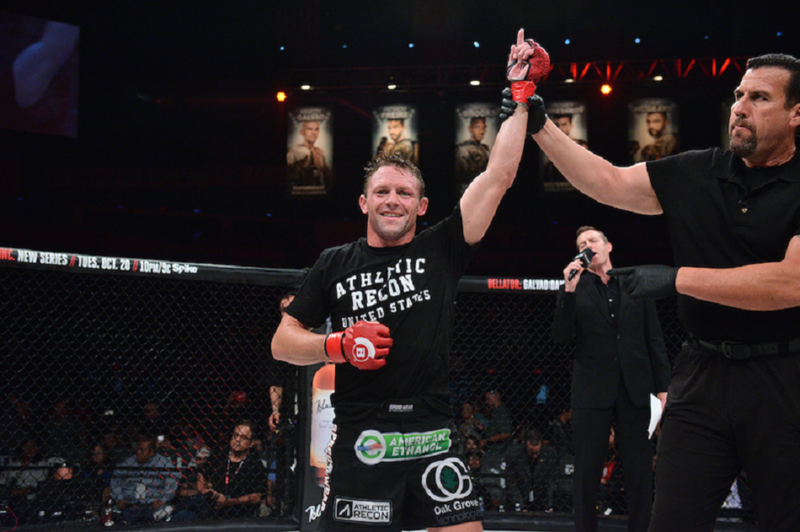 With the victory, “Spartan” has now strung together two consecutive victories before reaching the judges’ scorecards and solidifies himself as a force to be reckoned with in the Bellator MMA heavyweight division. Teixeira recently signed with the Scott Coker-led promotion and will look for a quick return to action following the first loss of his professional career. Quote: “You know, [Chase] Gormley is a tough dude. A former Titan FC champ who was mouthing off saying he could get an easy fight here with me. Well, welcome to Bellator!” Charles said. “I’m just really happy that I was able to show Bellator and the fans here what I’m able to do with a full fight camp. I’d love a rematch with Bobby Lashley, I know I kinda sh*t the bed there coming in on nine days notice. If I can’t get him, I want someone at the top, and I want the world to know that I belong there.